Stylish 2 and a half storey house with 2 bedrooms and 3 bathrooms, fully furnished, with modern fitted kitchen, air conditioning in both bedrooms, and an office room on the upper level. The house has covered off road parking and a small patio area at the front and back off the property, with BBQ . Internet and Cable TV are available. Siam Place is ideally located 4km from Sukhumvit Road on Siam Country Club Road. Surrounded by local Thai markets, shops, restaurants and easy access to the Bangkok motorway, Central Pattaya and Mapbrachan Lake. The village is very family friendly, and features excellent security, a large communal pool and fitness center. The house is available for long term rent and would be ideal for a professional couple or small family, and also for sale. 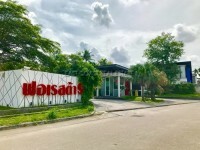 The title deed is held in Thai Company name.